The NeoART trial is for patients with Stage II/III bowel cancer (cancer that has not spread to other organs) who are waiting for an operation to remove their cancer. Our aim is to determine whether taking a 2 week course of oral artesunate 200mg daily prior to surgery can improve survival rates and reduce the risk of the cancer coming back after surgery. This study will compare 2 groups of patients: those who take artesunate with those who take a matching placebo (dummy pill). Colorectal cancer is a leading cause of cancer related morbidity and mortality with a global incidence of one million new cases per year. Each day in the UK, 110 new colorectal cancer cases are diagnosed. Over half of new cases present with locally advanced disease making recurrence more likely. Treating older patients is also more difficult and they are particularly at risk of death. Current standard treatments involve complex combinations of surgery, chemotherapy and radiotherapy. All these measures however haven’t increased overall survival beyond 60% five years after patients receive a diagnosis. Giving treatments like chemotherapy before going onto surgery could be an important way to improve overall survival for patients. This could be for several reasons. Shrinking the tumour prior to surgery may increase the likelihood of successful complete surgical resection as well as reducing the risk of contamination of neighbouring areas during surgery. The delay between recovering from surgery and starting post-operative chemotherapy would be avoided and if microscopic areas of tumour have spread then these may also respond to treatment. A problem up till now though has been that chemotherapy has significant side effects. This usually means that surgery itself needs to be delayed until someone can recover from these effects. A treatment that didn’t delay surgery and was well-tolerated would be a major contribution to taking care of patients while they wait for their surgical treatment. It would also tell us how important to overall success early treatment might be. There would also be great added value if any treatment that worked was also cheap enough to be used almost everywhere in the world. 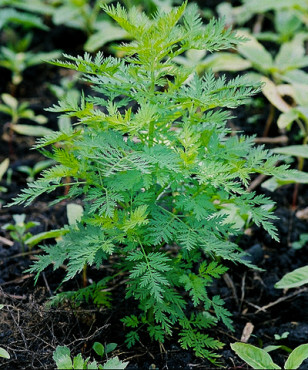 Artemisinins like artesunate are used worldwide as part of the treatment for malaria. They come from a plant called sweet wormwood, and have been used for more than two millennia in traditional Chinese medicine to treat a variety of ailments. Artemisinins are one of the most widely used antimalarial compounds, having been used to treat tens of millions of adults and children globally. There have been a number of lab based studies looking at the anticancer effects of artemisinins such as artesunate. In these studies artemisinins appeared to reduce the ability of cancer cells to survive and grow. A small pilot feasibility study in 20 patients conducted at St George's Hospital in London showed that pre-operative artesunate was well tolerated. There were also fewer cancer recurrences in the group assigned to artesunate treatment compared to the placebo group. We now need to do a larger studies: to see if these encouraging initial results are confirmed by looking at both the benefits and the side-effects of taking artesunate in a larger group of patients. A randomised, double blind, placebo controlled clinical trial is the best way to test the potential benefits and side effects of a new treatment. Patients participating in the trial are allocated to a treatment group at random. Neither the participant nor their doctor will know or be able to decide whether the participant is allocated to the artesunate group or a matching placebo. This reduces the risk of clinical bias. Patients can only participate in the study if the hospital they are being treated at is a participating site. If you are a cancer patient interested in taking part in NeoART, please talk to your doctor, who will be able to consider whether you are suitable for the trial. Patients can take part in NeoART if they have been diagnosed with Stage II/III bowelcancer that is operable. Patients cannot take part in the study if they are pregnant or have an immunosuppressive medical condition as we don’t know the full risks and side effect profile in these group of patients. What are randomised control trials? Randomised controlled trials (RCTs) are a type of clinical trial in which comparisons are made between a new treatment and the existing treatment (or standard care), to see which treatment arm is most effective. Patients are allocated to a treatment arm at random, based on chance, rather than a decision being made by the doctor or patient. This process is referred to as randomisation. Randomisation ensures that the two groups (or more) of participants in a trial are not selected in a way that could affect the results of the trial by introducing bias. A matching placebo is a "dummy" tablet that looks like the active drug but does not contain any active medicine. The reason we are using a placebo in this study is to make sure we can make as clear an assessment as possible about the potential effects of artesunate. Both patients and their doctors will be ‘blinded’ to the treatment allocation, making sure that the clinical trial data is independent and as free from bias as possible. Randomised, double blind, placebo controlled trials are the most reliable and rigorous way of comparing treatments in clinical research.